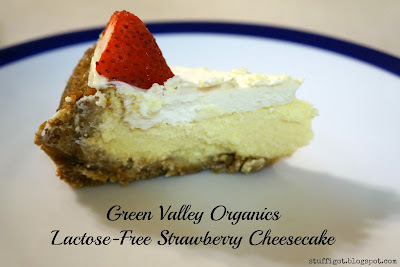 DISCLOSURE: I received free samples of Green Valley Organics Lactose-Free Cream Cheese from Moms Meet to facilitate this post. All opinions are my own. I love cheese. But, when I eat too much cheese, I usually end up with digestive issues the next day. I get gassy and usually end up with a stomach ache. So, I don't get to eat cheesy foods too often. 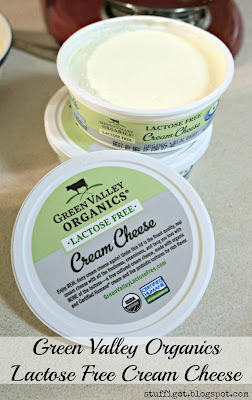 Thanks to Moms Meet, I had the chance to try out a lactose-free cream cheese from Green Valley Organics. I've tried lactose-free cheese slices before, but never lactose-free cream cheese. 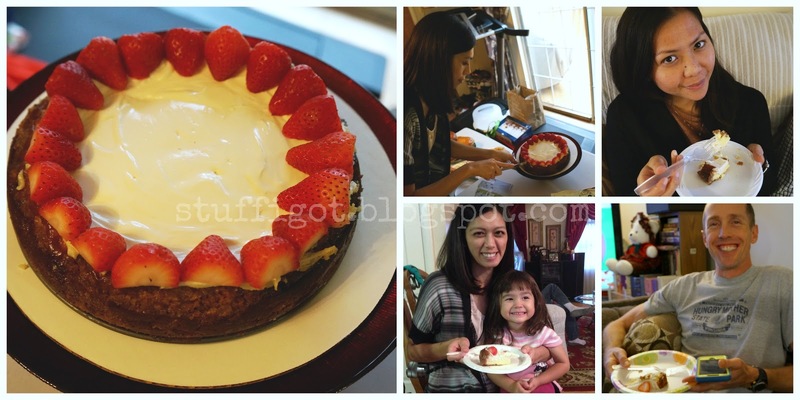 I thought a great way to sample the cream cheese was to make a cheesecake. My sampling kit included a recipe for West County Cheesecake that I used, though, I modified it a bit. I didn't have blackberries, so I did not like the Blackberry Sauce to serve with the cheesecake. I also bought some fresh bagels to serve with a container of the lactose-free cream cheese. I brought the cheesecake, bagels and cream cheese over to my parents' house. 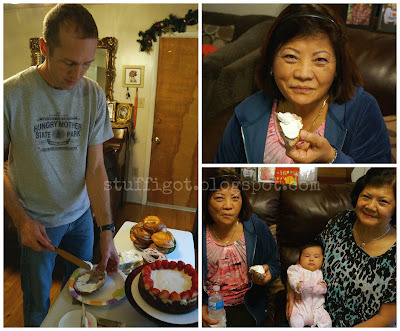 It was my Dad's birthday and I thought it would be a perfect occasion to have our family try out Green Valley Organics Lactose-Free Cream Cheese. Making the cheesecake wasn't too hard. Though, the lactose-free cream cheese is only available in tubs. I'm used to using cream cheese in bricks, when I make cheesecake. Other than that, the directions were pretty straightforward. 2. Toss the crushed graham crackers and 1/2 cup of the sugar in a medium bowl. Drizzle the melted butter over it and mix together. 3. Press the mixture firmly into the bottom and 3/4 up the sides of an 8-inch springform pan. 4. Place springform pan on top of a cookie sheet and bake for 10 minutes. Set aside to cool. 5. In a medium bowl, mix together the cream cheese, 1/2 cup of the remaining sugar and 2 tsp of the vanilla. Fold in the beaten eggs and mix thoroughly. 6. Pour the mixture into the crumb crust and bake (again on a cookie sheet) and bake until the center is just set, about 50 minutes. 7. Meanwhile, combine the sour cream, the remaining 2 tbsp of sugar, and remaining 1 tsp of vanilla in a small bowl. Spread it over the cheesecake, return to oven and bake for 15 minutes more. 8. 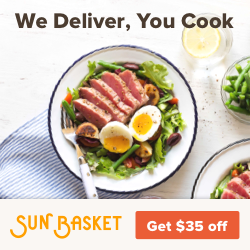 Remove from the oven. Let cool to room temperature. Cover and refrigerate thoroughly. 9. Before serving, cut tops off strawberries and cut in half. Place strawberry halves around the edge of the cheesecake. Next to the cheesecake and bagels and cream cheese, I set out coupons and a brochure about the different products Green Valley Organics makes. Everyone was pretty interested in trying out the cream cheese. 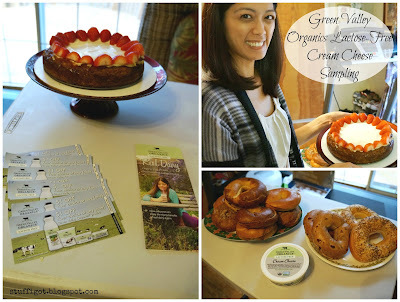 No one had heard of the Green Valley Organics brand before. We tried the plain cream cheese first. A lot of the guests thought the cream cheese tasted somewhat like fat-free regular cream cheese. But, the cream cheese definitely isn't fat free. 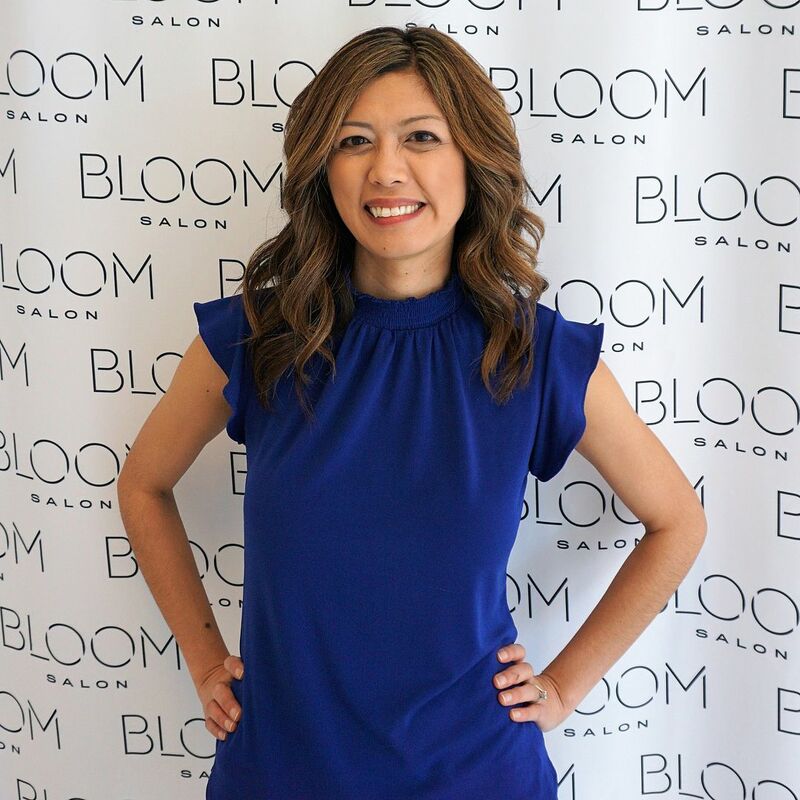 A 2 tbsp serving contains about 11 grams of fat. Next, we tried the cheesecake. I was interested to see how it would taste with the cream cheese being lactose-free. I was worried it may not taste as good, since the cream cheese on the bagels was somewhat bland. But, everyone thought it was good! If you didn't know it was lactose-free, you wouldn't be able to tell! Everyone gladly took some coupons home so they could pick up some Green Valley Organics Lactose-Free products, too. Green Valley Organics makes lactose-free yogurts, kefirs, sour cream and cream cheese. The milk and cream used in their products come from certified organic family farms in California. 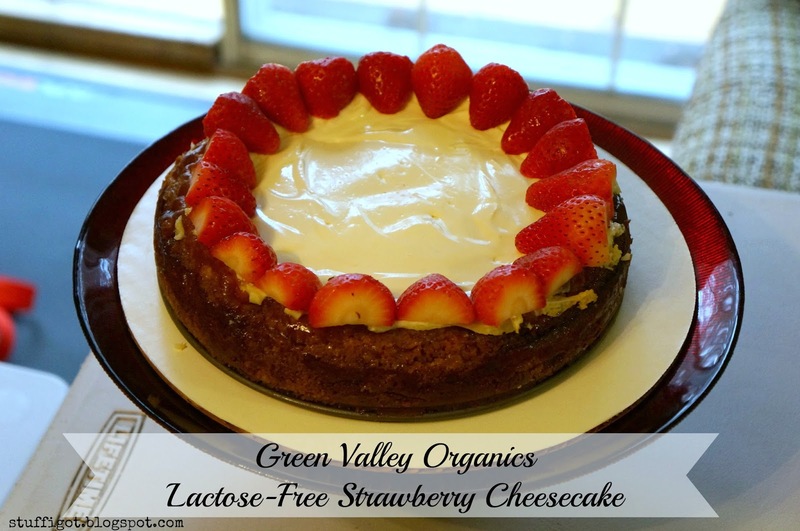 To make their products lactose free, Green Valley Organics adds the enzyme lactase to the milk to break down the lactose to easily digestible sugars. Green Valley Organics products can be purchased from Whole Foods, Safeway, Vons, and other natural food stores. To find a retailer near you, use Green Valley Organics' Store Locator.